Great Britain's Mo Farah says he has never taken performance enhancing drugs, after doping allegations were made against his coach Alberto Salazar. A BBC investigation alleged that Salazar had practised doping techniques with US athlete Galen Rupp. 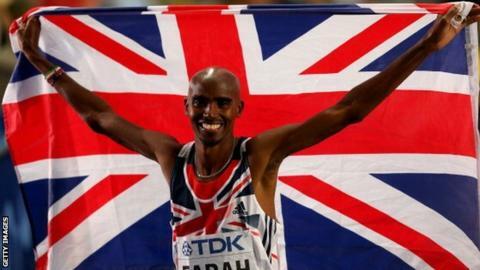 Olympic champion Farah said Salazar had reassured him the claims were false and "he will soon be providing evidence". "I've never taken performance-enhancing drugs in my life and I never will," added Farah on Friday. Farah missed two drugs tests before he went on to become a gold medallist in both the 5,000m and 10,000m at the 2012 Olympics. "Over the course of my career I have taken hundreds of drugs tests and every single one has been negative," said Farah in a statement on his Facebook page. "I've fully explained the only two tests in my career that I have ever missed, which the authorities understood, and there was never any suggestion that these were anything more than simple mistakes. "The last two weeks have been the toughest of my life - with rumours and speculation about me that are completely false - and the impact this has had on my family and friends has left me angry, frustrated and upset. "In particular, the media pressure on my young family and my wife, who is five months pregnant, is extremely painful, especially as I'm away training for some important races. " An "emotionally and physically drained" Farah withdrew from a Diamond League meeting in Birmingham in June. The 32-year-old said he wanted "to go back to the US and seek answers" after a "stressful week" when the investigation was broadcast. Distance runner Farah is training to compete in Monaco on 17 July in what will be his first race since doping allegations were made against Salazar. "As I made clear, I went to Portland to speak to Alberto Salazar and demand answers," added Farah. "He reassured me that the claims are false and that he will soon be providing evidence to make that clear. "Anti-doping regulations state athletes must give details of where they will be for one hour every day. But inevitably, on occasions, they're not at home when the testers come calling. We know that in 2011, around the time this story relates to, nine UK athletes missed two tests. But that number can change. In 2014 it was only one, so it's not common but it's not unheard of either. But the ramifications of missing a third test can be very serious." "Until then I will not be commenting further on the allegations. "I would like to take this opportunity to thank my fans, family, friends and team-mates for all the great support they have provided over the last few days. "I hope that I will now be allowed to focus on my training and winning medals for my country." Farah's first missed test was in early 2010, months before he joined Salazar's Nike Oregon Project, the Mail said. It reported the second one came at Farah's home in February 2011, when he claimed not to have heard the doorbell. Salazar is accused of doping Olympic 10,000m silver medallist Rupp in 2002, but denies the claims. Allegations Salazar practised doping techniques on Rupp were made in a BBC documentary called 'Catch Me If You Can', produced by Panorama and US investigative journalism specialists ProPublica. Rupp has denied allegations in the programme that he was given the banned anabolic steroid testosterone by Salazar as a 16-year-old. The documentary made no suggestion that Farah had been involved in doping.